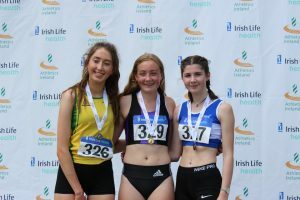 The National Juvenile Track & Field Championships came to an end on Sunday last with the third and final day of action in Tullamore. Wexford has enjoyed its best year ever at the championships with (including relays) 18 Gold, 10 Silver and 9 Bronze medals. Take a bow athletes, coaches and parents – it’s great to see all the hard work paying off. There were heroic efforts all over the place last Sunday both by those making the podium and those who missed out. One of the latter was Eimear Halpin of Menapians who, despite having a badly swollen foot as a result of being stung by bees, lined out in U15 250m Hurdles. Then there was Conor Brennan (DMP) who, in U17 200m, gave it everything, hurling himself across the line, but just missed out on making the final by 0.02s. Wexford’s top performer on the track was unquestionably the United Striders U14 dynamo, Myles Hewlett. With a Silver medal already in his pocket from the 800m the previous weekend he was determined to go one better in the 1500m. From the start Myles was the ring-master, controlling the race from the front and holding the inside line. He slowed the pace and nobody passed. Then with two laps to go he took off and built up a margin on his pursuers which they were never going to close. Myles crossed the line to take the Gold in a massive new best of 4.31.86 mins. 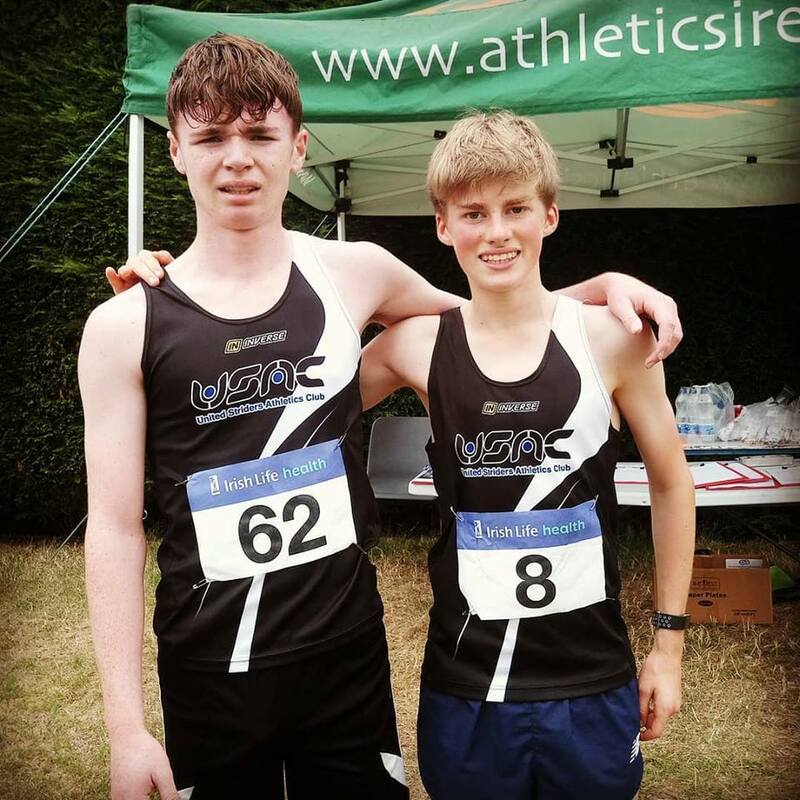 In the Boys U15 1500m Ben Wall (Adamstown) and Darragh Flannelly (United Striders) must have been inspired by his victory as they got themselves into the mix from early on. Ben came through for a well-earned Silver (4.31.95 mins) while Darragh pulled out all the stops in the latter stages to haul himself into the top three for the Bronze (4.33.85). Darragh will, one suspects, cherish this medal as he was very unfortunate not to make the podium the previous weekend in 800m. One other middle distance performance of note was Nathan Murphy’s 4th place finish in U16 1500m in a PB of 4.19.63 mins. The Menapians athlete, who is a newcomer to the event, has obviously been doing all the right training as he has improved leaps and bounds in a short space of time. 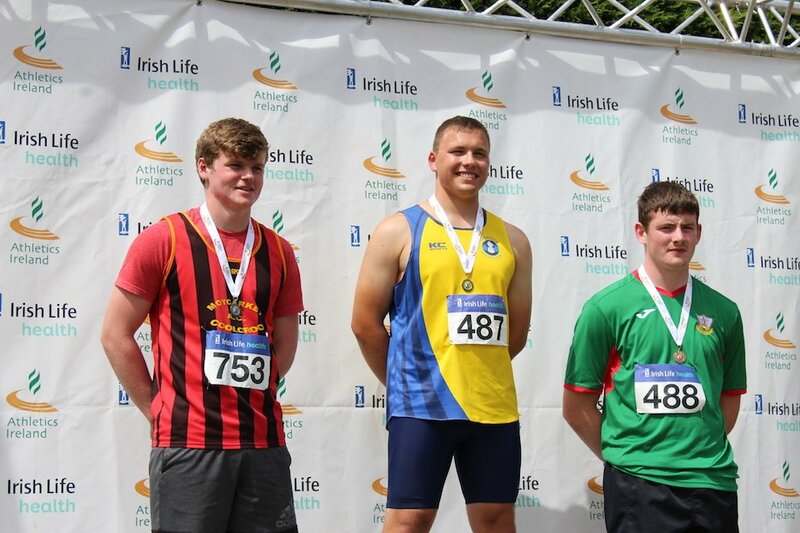 The county’s top field events performer was Padraig Hore (Taghmon). 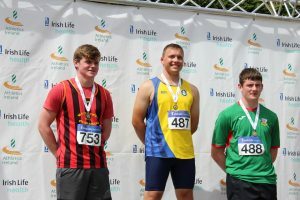 It has been a great year for the affable strongman as, earlier in the Summer, he won multiple medals at Leinster level (underage and Junior) and at the first weekend of the Nationals he picked up an All-Ireland Shot Putt Bronze (U19). Last weekend, in U19 Discus, he achieved a distance of 43.56m on his sixth and final throw to take the Gold. The only other Gold for Wexford went to Maeve Hayes of St Paul’s in U17 High Jump. She won, on countback, with a jump of 1.60m. 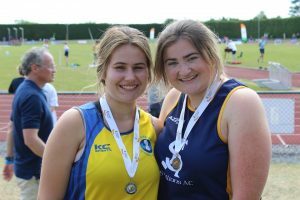 The bulk of the county’s medals last Sunday came in field events with our female athletes leading the way. 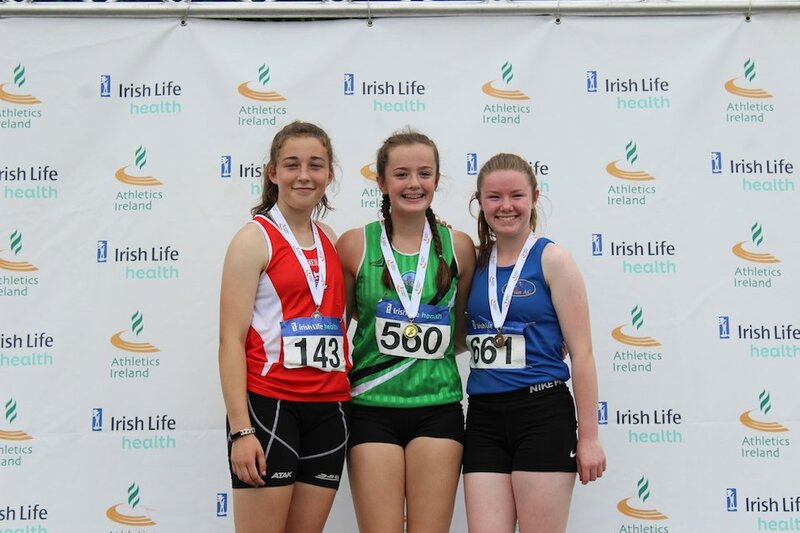 Bronagh O’Hanlon (Taghmon AC) was 2nd in U18 Hammer (36.23m). Sonia Mooney (Adamstown) was 2nd in U18 Javelin (29.42m). 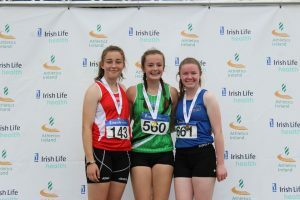 Amy Forde (St Killian’s) won a Bronze in Girls U19 Hammer to go with the one she already got in Discus. Saidhbhe Byrne (Enniscorthy) was 2nd in U15 Javelin getting a distance of 38.43m on her final throw, just 28cms behind winner. Kate Jackman (Adamstown) was 3rd in U17 Javelin (29.93m); clubmate Rachel Power was 4th (25.96m). Tara Doyle (Adamstown) was 5th in U18 Triple Jump (10.48m). Aoife Muldoon (United Striders) was 6th in U19 Triple Jump (9.20m). In Boys U17 Hammer Milan Mihaly Kovacs (St Paul’s) placed 7th with 30.22m. 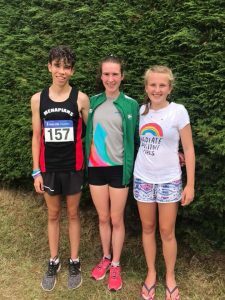 Aisling Kelly (Taghmon), just back from a successful trip to the SIABs in Scotland, won a Silver in U16 200m running a PB of 25.75s. 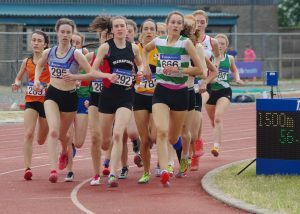 Blanaid Fogarty (Enniscorthy) was 5th in U17 200m (26.97s). Sammy Delaney (St Paul’s) was 6th in U19 200m in 23.60s. 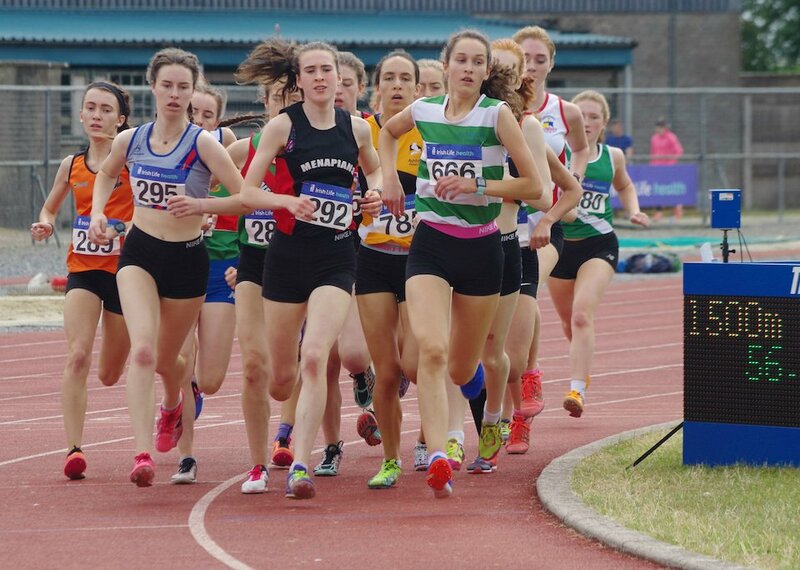 Róisín O’Reilly (Menapians), weary from her exploits in Scotland the previous day, still managed to place a close 4th in U17 1500m in a PB of 4.47.89 mins. 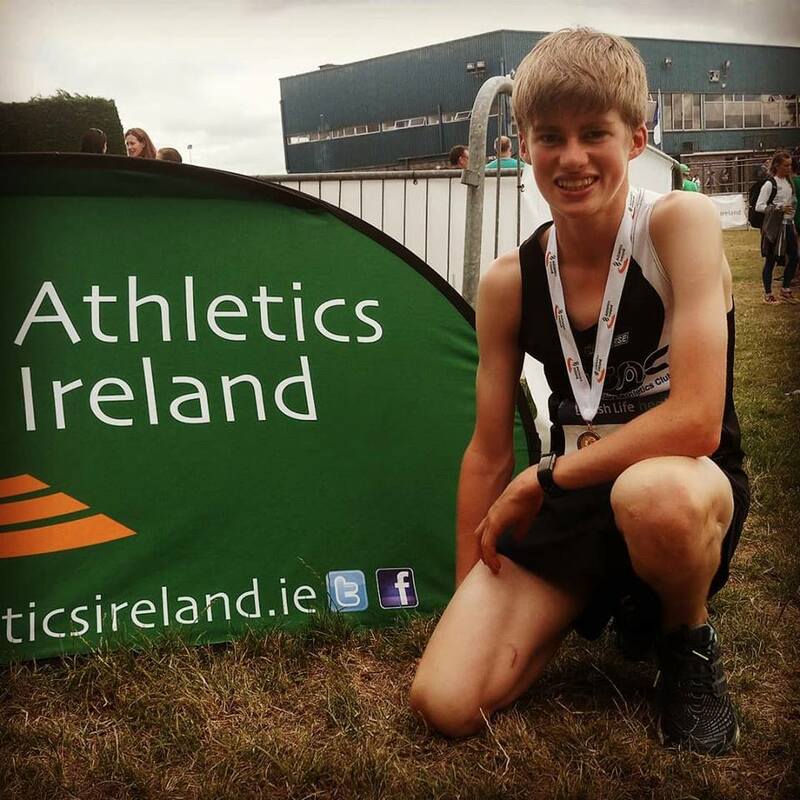 In Boys U19 1500m Aedan Rogers (United Striders) placed 8th in a time of 4.11.19 mins. While some athletes will be hoping to make the team for the Celtic Games, everyone else can take a break and enjoy what’s left of the Summer. 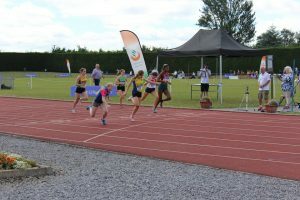 Tagged National Juvenile Track & Field Championships, Wexford success at National Track & Field. Bookmark the permalink.